Regulations for the protection of farmed animals in the EU set out requirements for the prevention of illness, injury and poor health, appropriate feeding, watering and housing as well as provisions to satisfy the animal’s natural behavioural needs . Poland’s Ministry of Agriculture & Rural Development regulations provide for fox and raccoon dog cages to be a mere 50 x 60 x 90 cm, while the space for mink is even smaller, 45 x 30 x 70 cm . Animals remain in small, barren wire cages, devoid of interest, which restricts their ability to exercise and perform natural behaviours such as running, swimming and climbing. This leads to the development of abnormal behaviours such as fur chewing and tail biting, which indicates an animal is not coping with the environment and is therefore suffering. 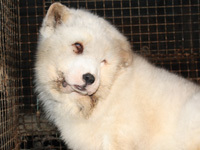 The scheme is part funded by the fur industry , creating a conflict of interest and bias. The WelFur scheme does not provide standards of welfare or guidance on the handling and killing of fur animals , which commonly involves restraint using tong-like devices around the neck or body and death by electrocution or gassing. Importantly, as ADI observations show, animals can suffer mishandling and cruelty during killing . Assessments made using the WelFur fox protocol do not consistently pick up on foot deformities (as a result of obesity) as an indicator of poor welfare, identified as the most common problem in fur farms investigated . Only a sample of animals are inspected during assessments of whole farms, housing potentially thousands of animals. Many physical health problems experienced by animals farmed for fur may not be visually obvious during inspections. For example breeding mink for larger body size to create bigger pelts can cause reproductive problems, metabolic disorders, and DNA damage , as well as psychological health problems due to the restrictive conditions . Given the poor level of welfare and space provided within the guidelines of the WelFur programme, it is difficult to see how it can have any meaningful impact on the life experience of animals farmed for fur. It is clear that the pressure to retain unhealthy, intense farming methods to aid increased production and improved profitability hopelessly compromises any animal protection measures. In this industry, regulation and certification has and continues to fail the animals. Previous ADI investigations of fur farms in Europe have provided evidence of the failure of official fur farming regulations and certification regimes. 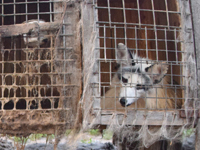 One investigation exposing horrific conditions and animal suffering in government-certified fur farms in Finland prompted inspections by the Finnish Fur Breeders’ Association (STKL) and the Finnish Food Safety Authority (EVIRA) with some farms losing their certification status.